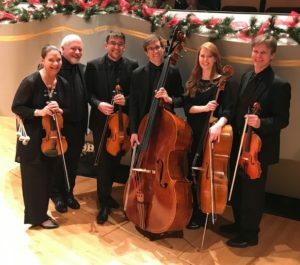 Start the new year off right with an evening of music by the Summit Strings and friends, led by Colorado Symphony violinist Karen Kinzie. The program will include the haunting and beautiful Golijov Tenebrae, the Grieg String Quartet in G minor, as well as the Sonata for Marimba and Strings by Colorado Symphony Principal Timpanist and composer, William R. Hill, which will feature guest artist Principal Percussionist John Kinzie. There will be a meet and greet reception following the performance. Please join us! Tickets are $15 for adults and $10 for students through high school and can be purchased here as well as at the door the evening of the performance. Parking is always free and we will enjoy a meet and greet reception following the performance.